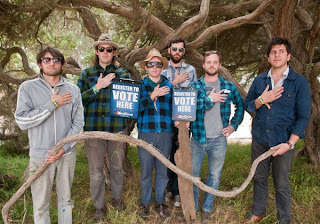 Dr. Dog and Cotton Jones tonight October 1st at The Rialto Theatre in a KXCI Presents! concert, doors open at 7pm. Dr. Dog’s unique brand of indie-rock finds inspiration in 60’s pop and psychedelic folk rock and has Tucson ties with Dimitri from Golden Boots as a member. Cotton Jones make classic sounding indie folk-pop. Tune in to 91.3FM Monday for your chance to win a pair of tickets. The Head and The Heart and Blitzen Trapper play another KXCI Presents! concert at The Rialto Theatre Tuesday, October 2nd.